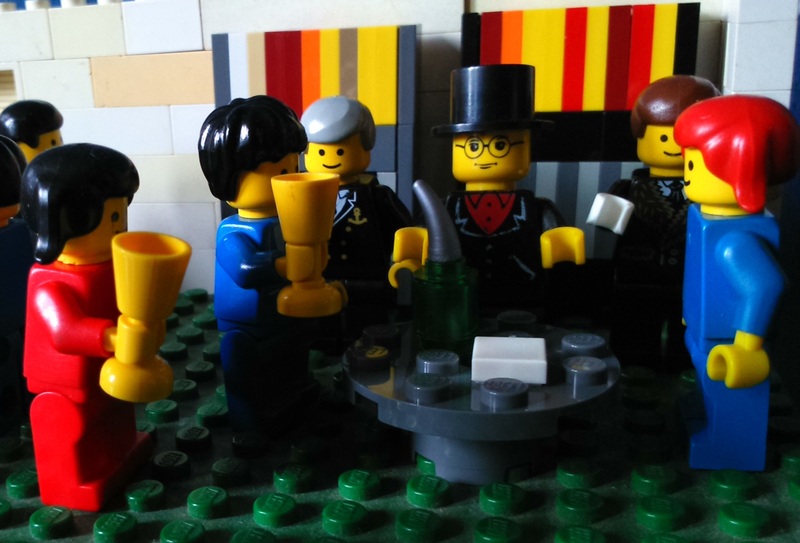 I’ve been making Lego models of my books again. 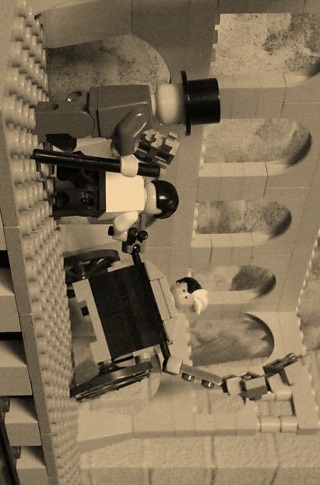 This week, a scene from Victorian steampunk adventure Guns and Guano, available for free from Amazon and Smashwords. Governor Cullen throws a party welcoming the adventurers of the Epiphany Club to his island. Sir Timothy Blaze-Simms entertains the guests by making an engine out of a napkin and a wine bottle. Don’t forget, Sir Timothy, you’re here on a mission! Governor Cullen tries to get Dirk Dynamo into the party spirit, while Isabelle McNair chats with Braithwaite and his impressive beard. Look how much Dirk loves a party! My latest steampunk release, Guns and Guano, has taken me into some tricky territory. Though it is in many ways a rollicking adventure story, it also deals with serious issues around slavery, colonialism and race relations in the 19th century. I firmly believe that a story can both be fun and carry a serious message, but in this instance that created serious challenges for me. I’m a white, male, heterosexual, middle-class English bloke. I am not part of a group that has ever suffered from systemic oppression, as happened to many Africans and their descendants as a result of colonialism, the slave trade and the racism that endures in some quarters to this very day. I do not know what it feels like to be in that position. I am unlikely to ever know, and no amount of research is going to give me a full understanding. This means that I can never fully understand or completely represent that experience. If I can’t do that, should I then avoid representing and addressing it? I think not. To do so would be to retreat into the safe and the familiar, to keep representing, and so perpetuating, the privilege of people closer to my background. It would be to avoid facing the uncomfortable elements of history that put us where we now are. And from a purely aesthetic perspective, it could get pretty bloody dull. So how do we, as writers, square this circle? How do we represent something if we can never get it quite right? For me, the answer is by being heartfelt and humble. I’ve tried to use this book to give some voice to the suffering of that oppression. Despite my best intentions, my initial drafts got a lot wrong, and thanks to the feedback of my beta readers the results are much better than they would have been. I know they’re still not perfect, that I’ve made mistakes and will continue to do so, but I’ve done my best, with the best of intentions, and I hope that people enjoy the results. 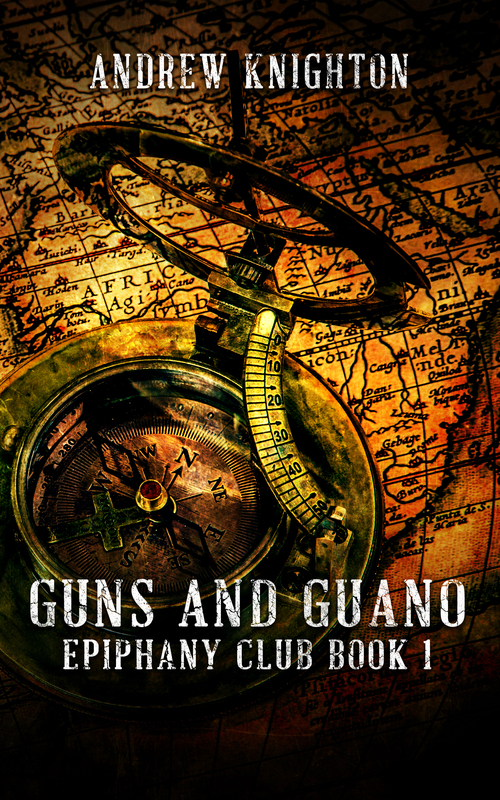 Guns and Guano, the first in a five volume story of action, adventure and the dark side of the Victorian age, is available now on Amazon and other ebook retailers, and is free from most sites. The second volume, Suits and Sewers, is coming in the next few weeks. My heroes, ready for action, adventure and a nice cup of tea. As with the previous exercise about plotting with the beginning and end in mind, I’m going to use this exercise to help me develop a novella I’m planning, Sieges and Silverware. The fourth in a series, this sees Victorian adventurers Dirk Dynamo and Timothy Blaze-Simms arrive at a German castle in their pursuit of clues to the location of the Great Library. 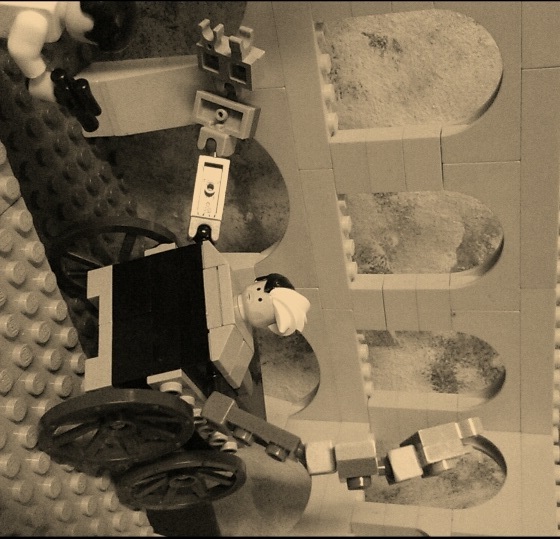 It’s 1871, Germany has just been unified, and the occupants of the castle are holding out against that unification. Major plotlines include a dispute with their former colleague Isabelle McNair, a siege of the castle, a mad scientist on the loose and some covert feminism in an age run by men. If I was working with pen and paper, I’d have to brainstorm all my ideas, then write them out again in order. Thanks to the magic of the digital age I can put them in order as I come up with them, and edit that order if I’m not happy with it. So what you’ll see is the end result. Dirk getting lost in the crazy layout of the castle. A civilised dinner party in a building being bombarded by heavy artillery. A monster hunt through the darkness of the castle dungeons. An argument that addresses the problems for women in gaining influence in Victorian society. Blaze-Simms invents a bizarre steampunk defensive device. A small band of heroes fending off a massive assault. A discussion on the nature and value of nationalism. The discovery of a mad scientist’s laboratory. Dirk and Isabelle reconciling their differences well enough to work together again. A desperate airship or balloon flight from the castle as it is captured. Theoretically, I can see a lot of value in this exercise as a way of starting plotting without losing your enthusiasm for a project. It lets you focus on all the coolest things you want to write, and then turn those into something at least a bit coherent and useful. But for me, in this instance, it’s proved less useful. I came up with a few interesting things, like the Carry on up the Khyber style dinner party. But whereas the first few volumes of this series were about throwing in lots of new cool ideas, by this point the story is about developing and paying off the stuff that’s already in there. I suspect that cool ideas will emerge from the structure, not the other way around. It’s fitting with the discussion from the podcast. Not every approach to structure is for everyone, and you use the ones that suit you. Did you try the exercise? How did you get on? And how do you go about structuring stories? Leave a comment, let me know what you think. Posted: March 7, 2015 in enthusing! Facing off against the mad genius. I love Lego. I love telling stories. 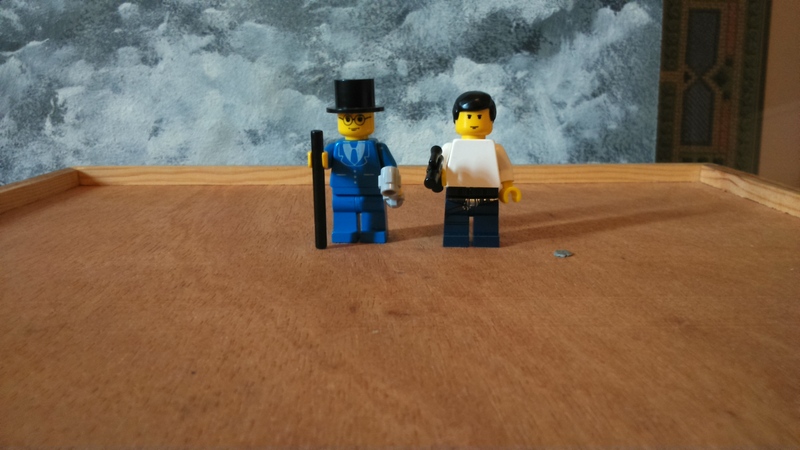 What better way to combine my passions than by building Lego models based on my own stories? So here’s my depiction of gentleman adventurers Dirk Dynamo and Sir Timothy Blaze-Simms battling the preserved head of Leonardo da Vinci. Da Vinci has been lurking for centuries in the sewers below Venice, perfecting his army of automata and preparing to take over the world. Getting up close with danger. Pity poor Leonardo – it’s lonely being a mad genius. I had great fun doing this, and will definitely make more. Next time ninja! The full story of ‘The Secret in the Sewers’ can be found in my steampunk short story collection Riding the Mainspring, free to anyone signing up to my mailing list. In a daring history that never was, pirates roam the skies instead of the seas. Fantastical airships sail the clouds on both sides of the law. Within these pages, you will find stories of pirates and their prey with a few more pragmatic airships thrown in. With stories ranging from Victorian skies to an alien invasion, there is something for everyone in these eighteen tales of derring-do! 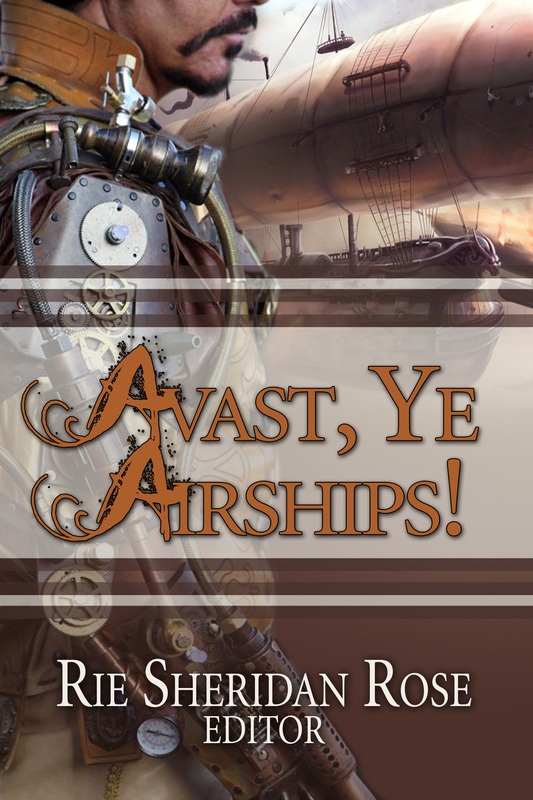 Tomorrow sees the launch of Avast, Ye Airships!, a collection of stories themed around airship pirates, edited by Rie Sheridan Rose. It features ‘A Wind Will Rise’, my latest story to feature Dirk Dynamo and Sir Timothy Blaze-Simms, gentlemen adventurers of the Epiphany Club, as they battle a slaving pirate airship over the Atlantic. If you’re anything like me, you probably love stories about both pirates and airships, which makes bringing them together doubly awesome. So what are you waiting for, me hearties? Hop on over to the publishers’ website to buy a copy. There be gold in them there clouds. “You said there’d only be one gorgon!” Myrrine yelled as she fled down the torch lit tunnel, sandals slapping against the cold stone. Behind her, the sound of many slithering bodies pursued them through the darkness. They rounded the corner and saw Ampelios scratching his head as he tried to remember which of two tunnels they’d come down an hour before. The Spartan had the muscles of a bull, but sadly the brains to match. There was a sharp snap and a bellow of pain. Ampelios staggered back out of the tunnel, blood spurting from what remained of his left leg. “There’s a trap,” he said, dull-eyed as ever. Ampelios fell to the floor, staring up at Myrrine as she rushed to his side. “Good thing we brought a physician, eh?” he said. She rummaged in her bag, looked up in frustration. “Where are my bandages?” she asked. “Used them to make the gorgon net,” Korinna replied, looking anxiously back down the tunnel. “Black rock the size of my fist?” Ampelios asked. Myrrine screamed. It wasn’t as cathartic as she’d hoped. Ampelios was starting to look pale, his fingers loosening around the stump, letting out even more blood. The slithering of pursuit grew louder. Something flickered down the tunnel. “But he’s twice my size!” Myrrine staggered beneath his weight, blood starting to soak the bottom of her toga. “Then you’ll have to run quickly.” Korinna shoved them towards the left hand tunnel, holding her shield up the way they had come. A moment later she turned and dashed after them. One of her feet clattered heavily against the ground. Glancing back, she saw that one of Korinna’s feet had turned stiff and grey, and the warrior was grimacing as she ran. They ran on up the tunnels, but the one-legged Ampelios was slowing them down, the more so because he was bent over, futilely trying to stem the bleeding. Myrrine glanced from him to Korinna. Inspiration struck. It was a desperate, probably futile sort of inspiration, but it was all she had. 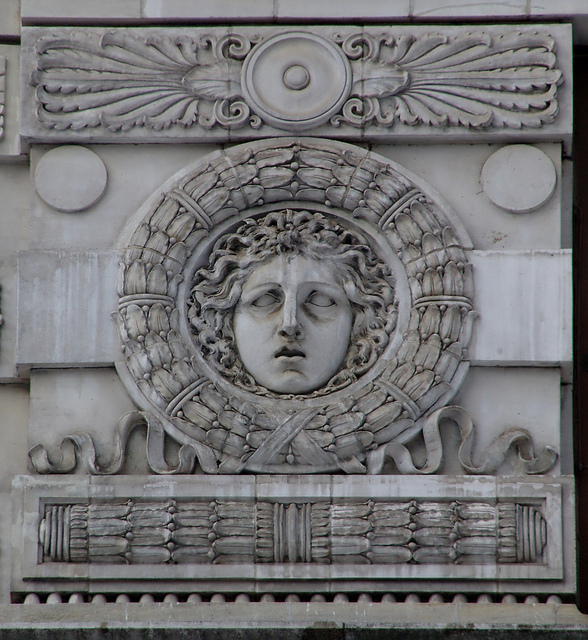 “Give me the head,” she said. Myrrine could hardly fight Korinna for what she needed, and she could still hear the gorgons approaching. In desperation she swung around, hurling Ampelios at the Amazon. Korinna’s sword clattered to the ground as she grabbed him with both hands. Desperation lending her speed, Myrrine snatched up the sword and sliced open the bottom of the bag. She grabbed the gorgon’s head as it fell out, averting its gaze before it could hit her, then directing it onto Ampelios’s ruined leg. The air tingled with power, and the stump stopped bleeding as it turned stone grey. He pulled his hands from it and stood up straight, leaning on the more secure support of Korinna. Myrrine thrust the head into her empty medical bag. At least that was good for something. This story was inspired by a conversation in a comment thread with H. Anthe Davis – I know this isn’t exactly a fantasy medical drama, but it’s a start, so thanks for the inspiration H.
If you enjoyed this you might also like my other Flash Friday stories, a growing collection of very short fiction. And for more fantasy stories, check out my ebook By Sword, Stave or Stylus. Picture by takomabibelot via Flickr creative commons.